Choose a nice phone number, which is easy to recall. No additional subscription fee. Visit the nearest Kyivstar shop or our partners' shop. 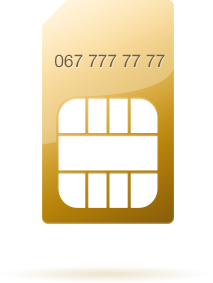 Pick the number to your liking and join the prepaid service. Next day after the activation you can switch to a contract without following additional terms and conditions. This is any set of digits, except for the combinations which have the same type of perfect or exclusive numbers. This is a number with repeated digit combinations or a number with a mirror reflection of digit combinations. For example: 067 456 22 33, 067 1234321. This is a number that has three same digits in succession, has digits in ascending/descending order or number consisting of 2 or 3 unique numbers that alternate and/or repeat. For example: 067 888 9 555, 067 9876543, 067 8988998. This is a number that includes four same digits in succession. For example: 067 8885555, 067 677 4444, 067123 4444. Choose phone number with two unique digits or number with five or more same digits in succession. From 15 000 UAH. This is a number that includes no more than two unique digits. This is a number that has no more than three unique digits and at least five same digits in succession. This is a number that has three same digits in succession or has digits in ascending/descending order. This is a number with repeated digit combinations or a number with a mirror reflection of digit combinations. You can get more information about the category, which your ideal number belongs to at the specialist in the sales and service center. The tariffs are indicated in UAH incl. VAT and The Pension Fund fee in the amount of 7.5 % of the service cost excluding VAT.